Meaning "apple slices" in Danish, Aebleskiver are like a cross between a pancake and a popover. Though they’re traditionally filled with apples, or dusted with powdered sugar and served with jam, these cute little pancake puffs can be customized to suit your taste. And whether you fill these dainty delights or not, you’ll start with the same egg white-lightened batter and a hot aebleskiver pan. Watch our Aebleskiver video to see the frying technique in action. There’s no getting around it — you need a special pan to make aebleskiver, and it’s reasonably priced. Find one at lodgemfg.com. Frying the aebleskiver is easy, but turning them in the pan may take a couple of tries to perfect. To avoid wasting batter, try frying one at a time until you get the hang of it. And to remove them, choose the tool that works best for you. We liked a small offset spatula for rotating, but chopsticks or skewers also work. Preheat oven to 200°. Heat aebleskiver pan over medium. Whisk together egg yolks, buttermilk, butter, sugar, and vanilla. Whisk together flour, baking soda, and salt; whisk into yolk mixture. Beat egg whites with a hand mixer until stiff peaks form. Whisk one-third whites into batter, then fold in remaining whites in two batches until combined. Add 1/2 tsp. oil to each well of pan. Fill each well to the top with a scant 1/4 cup batter and fry until a crust forms, about 2 minutes. Rotate aebleskiver one-quarter turn, spilling batter into the well; fry 1 minute. 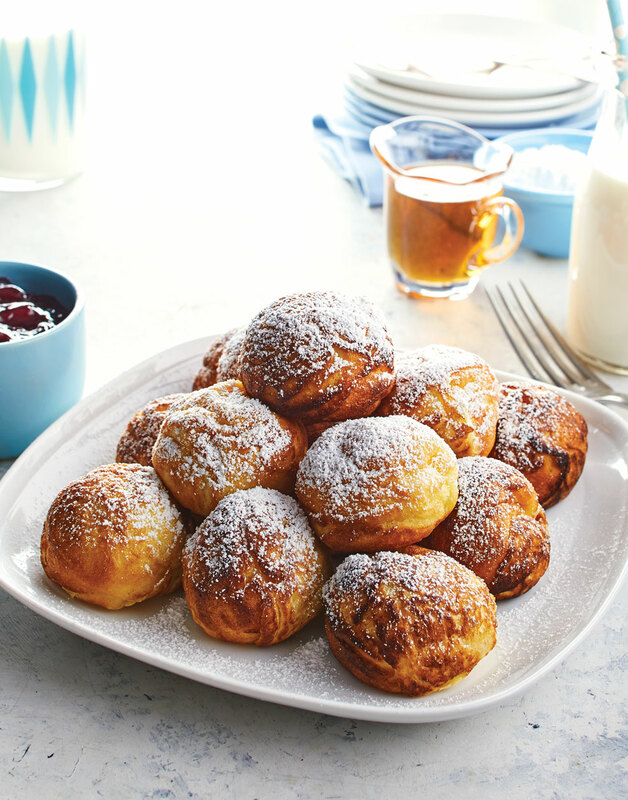 Watch our Aebleskiver video to see the rotating technique. Rotate aebleskiver a final one-quarter turn and fry until a toothpick inserted into the centers comes out clean, 1 minute. Transfer aebleskiver to a baking sheet and keep warm in oven. Fry remaining aebleskiver in remaining oil. So no yolks get into the whites, separate the eggs over an empty bowl; transfer both to other bowls. Fry aebleskiver until crusts form, about 2 minutes, before rotating one-quarter turn. After the first rotation, fry aebleskiver 1 minute before making the final turn.